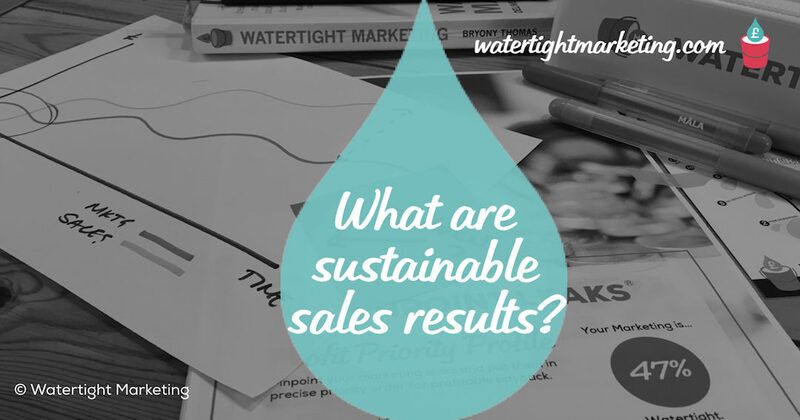 What are sustainable sales results? We talk about marketing that underpins sustainable sales results. So, let’s explore exactly what we mean by that, and why it’s so important to get to a point where your sales really do meet these criteria. I started out in charity marketing, where I learned that having a smaller amount of money on a standing order is often preferable to one-off donations of larger value. Why would this be? Predictability is critical to enable planning and investment. If your sales report is like a child’s drawing of a rollercoaster, it can be more than a little stomach churning for the person in charge of the purse strings. You will only be able to employ people, make infrastructure investments, and think calmly, when you have a reasonable level of predictability of income in your business. This is a virtuous circle, because sustained sales allow you to put the systems in place that make it easier to find, convert and keep more customers. What you’re after here is a clear idea of cause and effect, that can be communicated clearly and replicated. And, if you have an eye on gaining investment, or on an exit from your business with a large cheque attached, investors and potential acquirers will be looking for sustained and sustainable sales. This may sound obvious, but it can be overlooked in a rush for market share or community building… but only sales that more than cover their own costs are sustainable. The sales that you make need to cover the whole cost of acquisition, i.e. the cost of all the marketing undertaken to find and convert them, the time of all the people who talked to them, the cost of the resources used in delivering what they’ve bought, and the overheads involved in opening the doors and turning the lights on. You’ll also need to factor in the costs of covering any customer churn, i.e. cancellations or refunds that may happen. Businesses in the early stages are often able to keep their prices low as they may not have the overheads of offices, staff, technology, etc. But, as you scale you will need to bring on bookkeepers, data management, customer service, etc. The prices you charge need to over all of this. Now, here’s the biggie for me! Sustainable sales are those for which you can sustain your energy and motivation. If your days are filled with the kind of work that makes you want to tear your own hair out, you don’t have a truly sustainable business. It can be easy in growing a business to say yes to ‘low hanging fruit’ – this can be a tempting distraction. Or worse, it can lead you into building a business that you don’t enjoy, and find it hard to recruit for. One of the Four Foundation Leaks (See: Chapter 2 and 11 of Watertight Marketing), is ‘The Wrong Kind of Work’. This is where the work you take on is either unprofitable, or demotivating, or both. We walk people through a simple framework to assess the kind of work that’s truly sustainable in the long-term. You can overlay this with the Pareto Principle to get to a good mix. You’re aiming for 80% of your work occupying the top right of this quadrant, with 10% in each of the ‘Maybes’. From a marketing perspective, there’s another way to use this framework, and that’s to assess your content. Everything you talk loudly about should be on the right-hand side of this matrix. You can quietly take on some cash-building clients, but only talk loudly about the work you really want to attract. I hope to welcome you along to one of these sessions, and into the growing community of experts and peers using this approach to step off the entrepreneurial rollercoaster. This is your step towards the relief of taking confident decisions on exactly where, when and in what order to focus your energy.